Would you look at that! One week of this year's interrupted by grace April series is already behind us. Time flies when the weather starts to get nice and you're blogging every day! Have you been on the look out? Have you experienced the Lord interrupting your program to bring you an announcement of His love for you, conviction of sin, a burst of thanksgiving, or something else? Share your story with someone; testify to God's activity in the world even now. He is near and He is good. After reading through John during Lent, I thought I'd give another one of the Gospels a shot over the next month. Yesterday I was in the second chapter of Luke, moving along nicely through the story of Jesus's birth and shepherd's visit. Then I got to the account of Jesus's circumcision and the family's visit to Jerusalem to present Jesus to the Lord, another custom. All along, I had in my head that Simeon was a priest in the temple and part of the ceremonies. Boy, was I wrong! "Now there was a man in Jerusalem called Simeon, who was righteous and devout. He was waiting for the consolation of Israel, and the Holy Spirit was upon him. It had been revealed to him by the Holy Spirit that he would not die before he had seen the Lord's Christ. 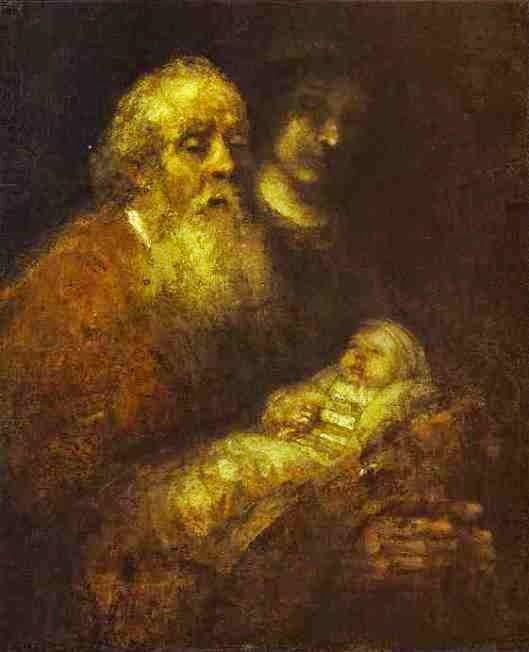 Moved by the Spirit, he went into the temple courts ..."
Simeon was not a priest. He was not part of the religious elite. He was a man in Jerusalem. He was righteous and devout. He obviously listened to the Spirit. But he was just a man. That interrupted me. What interrupted me by grace was the glorious hope that God can make big promises and do amazing things in an ordinary life lived for Him, just as much as He is willing to in the life of someone more earthly notable. I imagine that Simeon was an unassuming fellow who loved His God and built his life around loving and serving Him. No pomp and pride, just ordinary, day-to-day, run-of-the-mill faithfulness. And did you see that promise God made to him by the Spirit? HE WOULD SEE THE MESSIAH, THE CONSOLATION OF ISRAEL BEFORE HE DIED, a promise God kept. This grace interruption makes me want to continue in faithfulness, not because I hope to receive a cool promise like Simeon's, but because it reminds me that God sees and knows and loves each one of His children, even me. I want to love Him back with some ordinary, day-to-day, run-of-the-mill faithfulness!